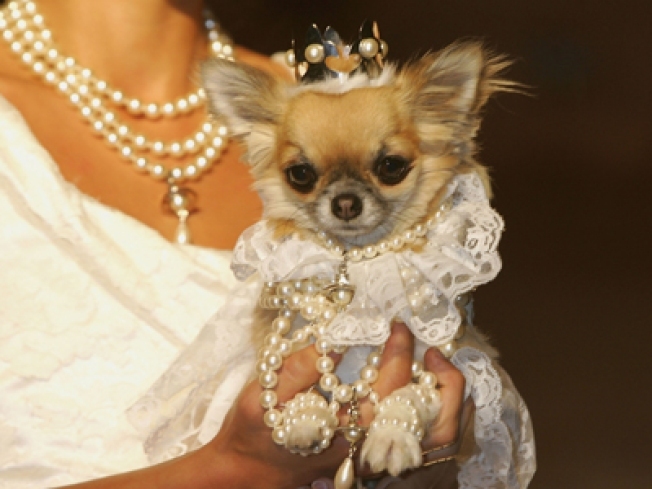 The cute backlash continues with a site that shows your pets at their most "embarrassed"
"Lily the Chihuahua" is dressed in Vivienne Westwood Bride at the Harrods Pet-A-Porter Fashion Show. It's this kind of stuff that the new "suicidal pets" blog lambasts. Enter Pets Who Want to Kill Themselves. The site posts pictures of domestic animals being made to do things by humans they really, really shouldn't, like getting carted around in a backpack-style contraption, being dressed up as "Woofgang Pup" complete with foofy chef hat and blinged-out shades, or nuzzling up to Kurt Russell's chest. PETA can't really step in in cases of abuse by embarrassment, so it's up to you to shame these pet owners by clicking. In related news, U.K. dog owners who dress up their pets could face prosecution by the RSPCA for putting their animal's welfare at risk.